The ninth annual amfAR Gala Los Angeles has arrived and dozens of stars are traveling to the Wallis Annenberg Center for the Performing Arts in Beverly Hills for the special evening. 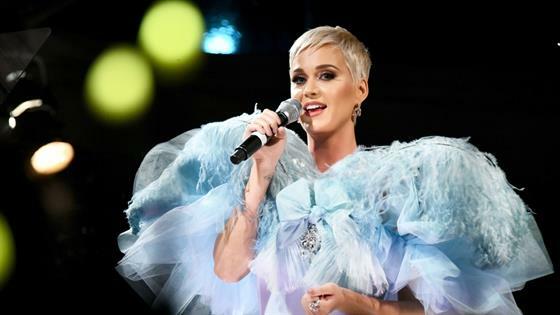 This year's gathering will honor singer-songwriter Katy Perry as well as Toms founder Blake Mycoskie with the Courage Award for their "profound commitment to the fight against AIDS, as well as countless other humanitarian causes." The evening, hosted by Perrier-Jouet, will also feature a musical performance by Dame Shirley Bassey following a cocktail reception, dinner and live auction. Before the fun begins, however, your favorite Hollywood stars are stepping out on the red carpet and showing their support for a great cause. Take a look at some of the winning looks in our gallery below. The American Idol judge celebrates her special honor in a blue dress and BVLGARI high jewelry diamond rings. The actress stuns in a yellow, strapless gown that is accented by silver detailing. The seldom-seen star braves the crowds in his tuxedo for an appearance at the A-list event. Hearst wore a black figure-hugging HANEY gown, which featured a thigh-high leg slit. The America's Got Talent judge modeled a stunning red dress with billowing sleeves. The actress flaunted her figure in a flattering A-line dress. She completes her look with Hearts On Fire jewelry. Gigi complimented the red backdrop in a black ballgown and had her blonde locks styled in a retro curl. The performer opted for a powerful, shimmering pant suit that featured a plunging neckline. Bold and beautiful! The actress donned a slightly see-through bright yellow, chiffon dress, which she matched with a white clutch and Yvan Tufenkjian jewels. The model steps out in a Atelier Patty Ang dress while supporting an important cause. amfAR began in 1985 thanks to Elizabeth Taylor. Since then, the organization dedicated to the support of AIDS research, HIV prevention, treatment education and advocacy has raised more than $517 million in its programs. Find out how you can help by visiting their website.